The title 'Paris Quartets' requires clarification. Telemann wrote six such pieces which he published in Paris in 1738 as Nouveaux quatuors after taking out a royal privilege entitling him to do so. Eight years earlier, in 1730, he had printed in Hamburg six Quadri. These were later issued in Paris in a pirated edition by the publisher Leclerc. While it is of course convenient to shelter all 12 works under the same umbrella or rather, perhaps, parasol, there are important differences between the sets even though it is possible Telemarm saw the later one as a corollary to the other. 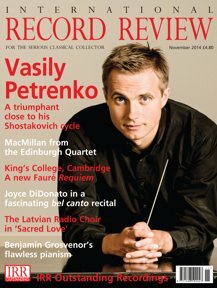 The present disc contains three items from the Hamburg set and one from the Paris co1lection. A distinguishing feature of the earlier publication is Telemann's equal subdivision of the six pieces into sonatas, concertos and suites. By so doing he was better able to achieve a conspectus of national styles. The Concertos contain a strong element of Italianate display while the Sonatas follow the four‑movement 'da chiesa' scheme with a strong fugal bias. The Suites are pronouncedly French in their vernacular while all is suffused with Telemann's irresistible charm and what Quantz was to term the 'mixed style' of Germany. 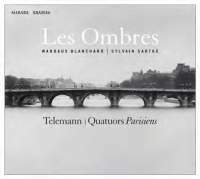 Les Ombres have chosen from the Hamburg set its two Sonatas and the first of its Concertos. These musicians play with sensibility. Telemann's lucid textures and that 'délicatesse' of which his French admirers were so enamoured are treated with poise. The opening movement of the Sonata in A major, marked Soave, provides a good example of what I mean. Generally speaking, slow movements enjoy stronger characterization than faster ones in the hands of Les Ombres and in the E minor Quartet of the 1738 collection their articulation, mellifluous though sometimes lacking in crisp definition, does not do the music full justice. The splendid Prélude offers some of the finest writing in the set, as does the noble concluding Modéré, a chaconne with a six‑bar statement in the bass over which the obbligatists play free variations. All is played with finesse though sometimes, as in this beautifully constructed and expressive conclusion the unique Telemann allure is understated.